GetUp! - Climate action. Are we getting any? Climate action. Are we getting any? The Turnbull Government's rhetoric on clean energy has completely shifted since Tony Abbott's departure. Prime Minister Turnbull is spruiking his longtime support of renewable energy, and knows how much the Australian electorate support investment in clean power. Now, it's time for the Turnbull Government to match the rhetoric with policy. Labor have already committed to a target of at least 50% clean renewable power by 2030. Now, we need to pressure the Turnbull Government to match or overtake that target. Can you sign this petition calling on Malcolm Turnbull to commit to at least 50% renewable power by 2030? And please share with your friends! 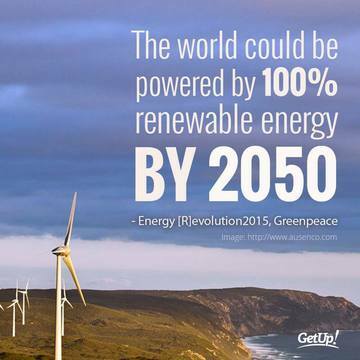 We ask that you match or overtake Labor's commitment to 50% clean renewable power by 2030. Australians love clean renewable energy, and it's the right call for the environment and the economy.